My decision to run this half marathon in Abu Dhabi was very short-noticed. I usually sign up for all my runs of the season in September, soon after registration opens. In previous years my first half marathon of the season would be in mid-December. A strategic decision, because weather conditions for long-distance (like 20k+) outdoor running in Dubai only become bearable during November. In other words, my serious training for the upcoming half marathons only started in November in previous years. Now I would already run one in November. I waited until the very last day that registration was open. By that time, I was training for the full marathon in January and already had a 21k training run under my belt. That was proof enough that could run the distance, so I signed up for the race. Another 26k run as part of the marathon training followed, which added to my confidence. Race day comes, and I get up at 4am to meet up with fellow runners. As usual, I didn't need my alarm clock to get up at 4am. The adrenaline in my body is working very reliably the night before a race. I woke up about every two hours straight through the night, each time ready to get up and go running. Abu Dhabi is an hours drive away from Dubai. The race was supposed to start at 6.30am, just after sunrise. We reached about 45 minutes before the start, early enough to visit the toilets numerous times, check out the start area, and check out who else is running. 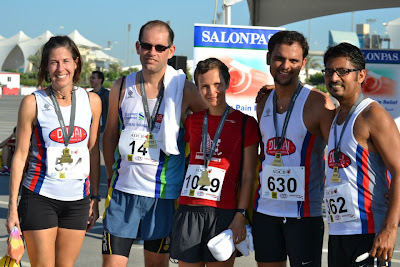 The running community in the Emirates is not huge. The usual suspects were getting ready. The usual question was asked: What time are you going for? My half marathon goal for this season was to run under 1:45:00, which would qualify me to a preferred start for the following half marathons. Not a huge goal, as I only had to shave off 16 seconds of my PB. Yet, I wasn't sure if I could do it in the first run of the season. The gun went off, and I settled into a pace of about 5min per km. That would bring me home in about 1:45:00. My leg muscles felt a little tight, probably from the strenuous marathon training that I have been doing. I was just hoping to be able to keep up this pace. The race went nice and steady up until 10-12km. Not many people overtook, nor did I overtake many people. It was a quiet race. No-one was talking. Not that I am usually a chatterbox while running, but you get to hear one or the other remark about the weather, the course, the current feelings, etc. During this race no-one was talking. At 15k, I decided I had some energy left to shift up gears. 6k I could oversee. Just another 30 minutes to go, I told myself. According to my watch I wasn't particularly faster, perhaps just a few seconds per km. It probably just took more energy to keep at the same pace. But I kept on overtaking people on those last kilometers. And that's always a boost to your confidence. I felt strong and I wondered if I should have started my "sprint" even before the 15k mark. I finished at 1:44:56 (gross time) and landed a new PB with 1:44:39 (net time). That's about 40 seconds off my previous PB from February this year. I finished 15th woman (out of 140 or so), and was 12th in my age group ( all the under 40s). I reached my goal! I am now qualified for a preferred start at future half marathons in the UAE. I am happy. 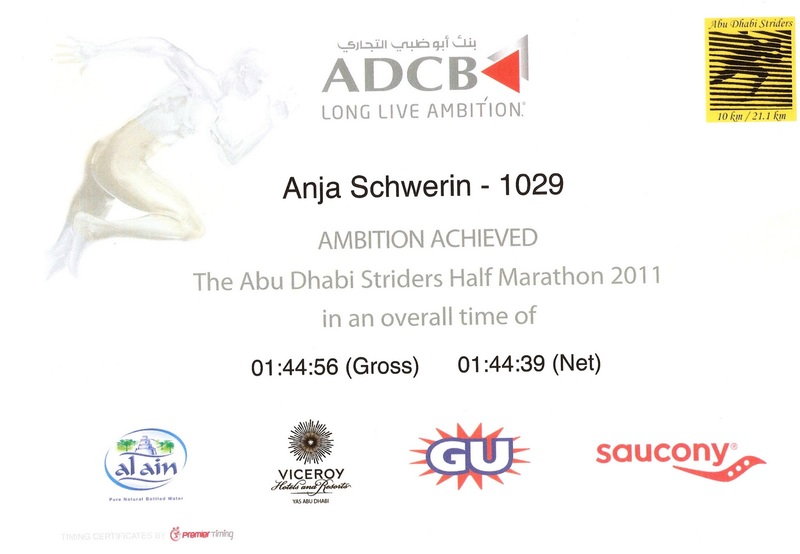 I am running another half marathon in 3 weeks time, here in Dubai. Can't wait to see how I will do there!